Amatrol’s Mechatronics Learning System – Siemens S7-1500 (870-S715) provides a Siemens S7-1500 programmable logic controller (PLC) with 2-port PROFINET switch used by learners in conjunction with Amatrol’s Mechatronics system to program, operate, and adjust components and applications on an automated production line. PLCs are a vital part of modern industry and are used in innumerable applications across the automotive, manufacturing, packaging, and pharmaceutical industries, just to name a few. 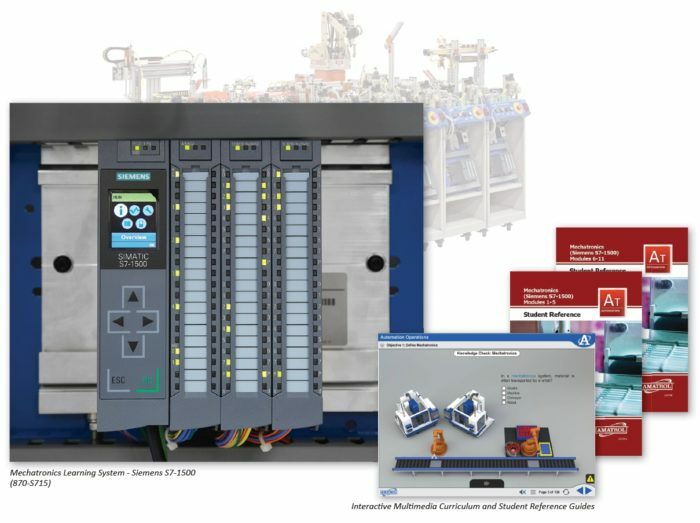 Each of Amatrol’s Mechatronics carts requires one Siemens S7-1500 learning system, so you can buy one cart to train on a specific skill, such as indexing, pick-and-place, or gauging, or buy the entire Mechatronics system to recreate a fully functional automated line in your classroom or training center! The Siemens S7-1500 learning system includes a SIMATIC S7-1500 PLC with a PLC mounting console, a 24 VDC power supply, a master control relay, interactive multimedia curriculum, an install guide, and student reference guides. This industrial PLC training system covers major topic areas such as mechatronics safety, electrical sensors, actuator adjustment, stepper motor programming, torque adjustment, discrete I/O handshaking, system startup/halt, and much more! Amatrol’s Mechatronics and PLC training is second-to-none. Featuring real-world industrial components and PLCs, these learning systems will help learners gain hands-on skills and knowledge that can be applied to real, on-the-job tasks. The Siemens S7-1500 learning system’s major component is the SIMATIC S7-1500 PLC. Learners will use the PLC with Amatrol’s Mechatronics carts, a computer, and STEP 7 PLC programming software to build the most real-world applicable skills possible! The Siemens S7-1500 learning system allows learners to design a variety of PLC programs including: manual/auto/reset functions; discrete I/O handshaking for multiple station quantity production; and sequencing various mechatronics station applications like part transfer modules, part insertion modules, and a non-servo electric traverse axis. Amatrol’s Mechatronics course curriculum offering is an impressive presentation of comprehensive theoretical knowledge. This curriculum begins with an introduction to mechatronics and mechatronics safety and quickly builds on concepts like station operation, component adjustment, module sequencing, and station sequencing. Examples of topics from the curriculum include: manually overriding an electro-pneumatic valves; sequencing the operation of a 2-axis pick and place manipulator; adjusting a fiber optic sensor; sequencing the operation of a parts queueing module; operating a gravity feeder with escapement; adjusting motor starter overloads; and much more! This learning system’s curriculum is presented in a stunning interactive multimedia format that features 3D animations, graphics, text with audio voice-overs, and much more! The Siemens S7-1500 learning system can be used with any or all of Amatrol’s Mechatronics carts, which include Pick and Place Feeding (87-MS1), Gauging (87-MS2), Orientation Processing (87-MS3), Sorting/Buffering (87-MS4), Servo Robotic Assembly (87-MS5-P2), Torque Assembly (87-MS6), and Inventory Storage (87-MS7). Additionally, Amatrol offers Mechatronics PLC training with other Siemens PLCs, such as the Siemens S7313C with MPI port (870-S7313, 870-S7314), as well as Allen-Bradley PLCs, such as MicroLogix (870-AB12), AB CompactLogix L32 (870-AB53), and AB CompactLogix L16 (870-AB53A). While an Amatrol Mechatronics line can feature just Siemens or Allen-Bradley PLCs, this automated line also allows for a mix of both so learners can train on industry’s two most widely-utilized PLCs simultaneously. Sample copies of this course’s Student Reference Guides are included with the learning system. Sourced from the curriculum, these Student Reference Guides take the entire series’ technical content contained in the learning objectives and combines them into perfectly-bound books. If you would like to inquire about purchasing additional Student Reference Guides for your program, contact your local Amatrol Representative for more information.